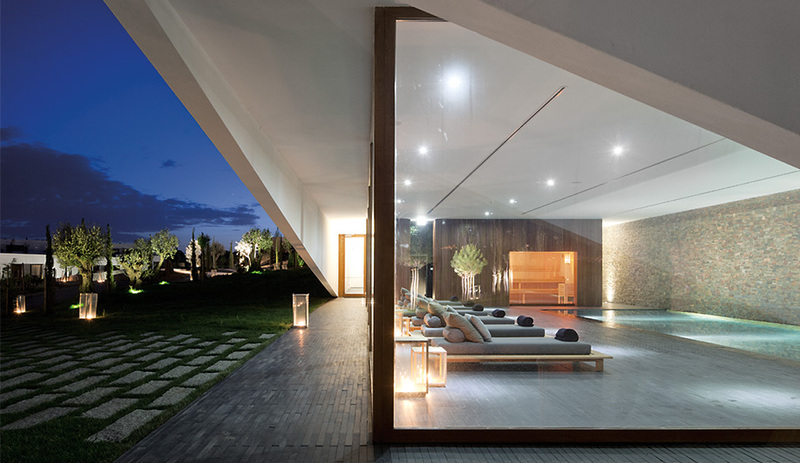 Designed by Lisbon architecture firm Promontório, the striking, prism-like central building houses the resort’s reception area and lounge, a restaurant, a winery and a spa. The main building supplies hospitality services to guests and private owners. In the foreground, concrete lattice spans a townhouse patio space. The architecture of the entire resort reflects the Mediterranean courtyard house concept. Open patio spaces abound. 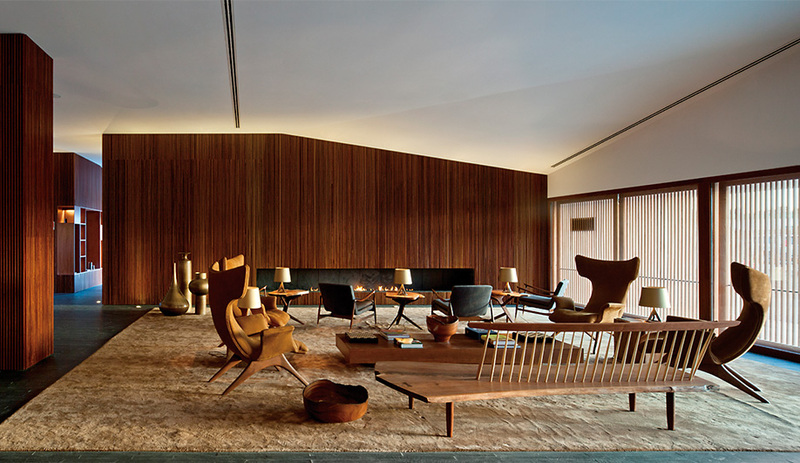 Designed by Márcio Kogan of Studio MK27, the hotel’s lounge features a long fireplace paired with expressive furniture. For the pool and sauna area, Studio MK27 selected Gervasoni chaise longues. Left: Hotel guests stay in one of the 10 Sky-View Suites, named for the skylights over the beds. Other options include owner villas or townhouse suites when available. Right: Studio MK27’s minimalist approach is warmed by a profusion of wood, and opulence figures in such choices as a huge soaking tub. In the guest suite’s ample living area, light fixtures by Tom Dixon and Secto are paired with a wooden table designed by Studio MK27. 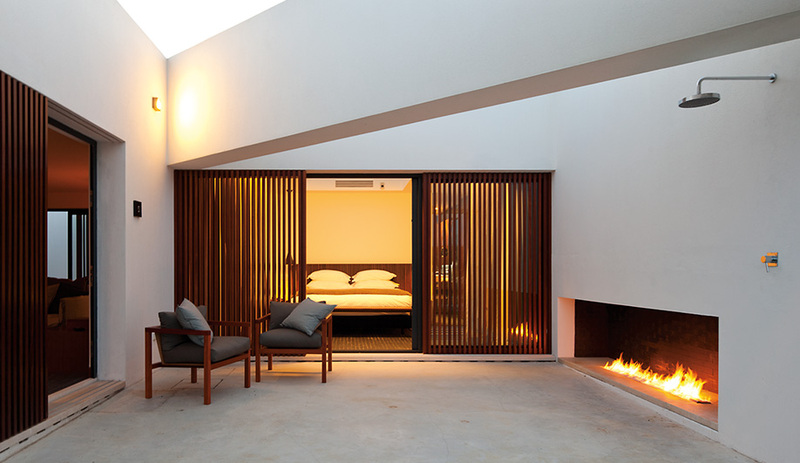 Private patios with gas fireplaces and outdoor showers offer guests a secluded haven. L’And Vineyards is an hour’s drive east of Lisbon, near the walled town of Évora. Beyond the gates, the first thing you notice is rows of newly planted grapevines weaving among 200-year-old olive trees. Then your attention is drawn to the white-washed facade of the prism-like hotel, which seems to float above the ground. In the distance, the ruins of a medieval castle crown a hill, while a few dozen sheep dot the farmlands below. Surprisingly, the minimalist hotel and its rural surroundings blend perfectly. 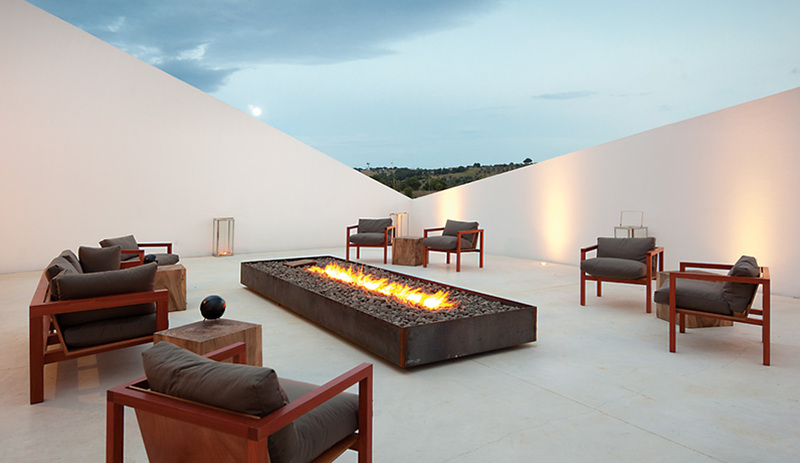 The resort is one of the country’s first winery-hotels, marrying the owner’s love of contemporary architecture with the Alentejo region’s history of winemaking. 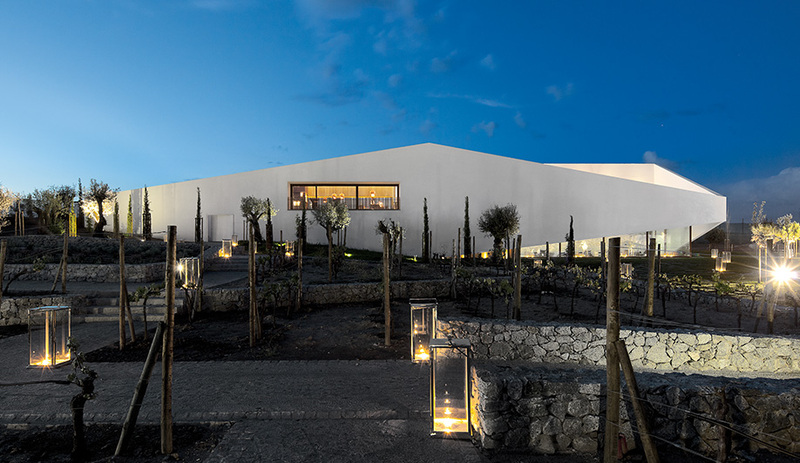 A few years ago, when the Sousa Cunhal family group decided to branch out from its agricultural and winemaking business, it enlisted the Lisbon firm Promontório to design a central structure ( referred to as the hotel ) to house the resort’s reception area and lounge, a restaurant, a winery and a spa. The striking building, which opened in May 2011, supplies hospitality services to a range of completed and planned accommodations for rental and private owner use. Promontório, which created the master site plan, also designed a cluster of 31 townhouses with wide patio spaces. 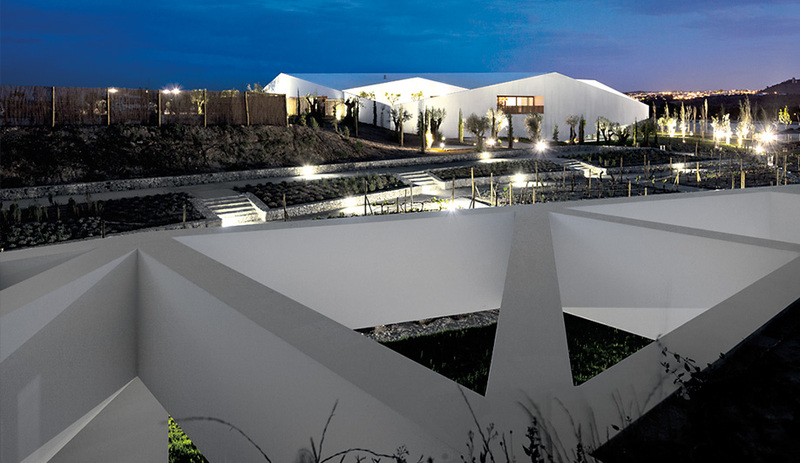 Configured in seven blocks, they are arranged like an amphi­theatre around a man-made lake. Of these, ten 120‑square-metre Sky-View Suites (named for the large skylights over the beds) are designated for hotel guests. 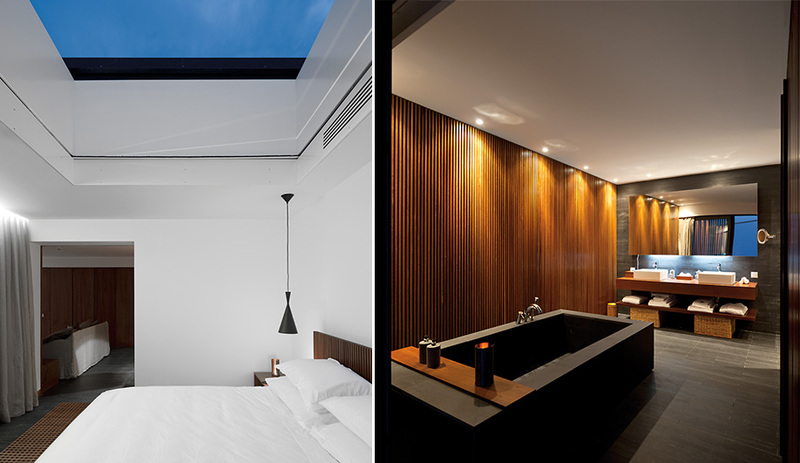 The suites are partially recessed into a hill, each slightly askew for privacy. Elevated behind them is a second row of privately owned one-­storey townhouses, the L’And View Suites, that go into the L’And rental pool when owners are absent. 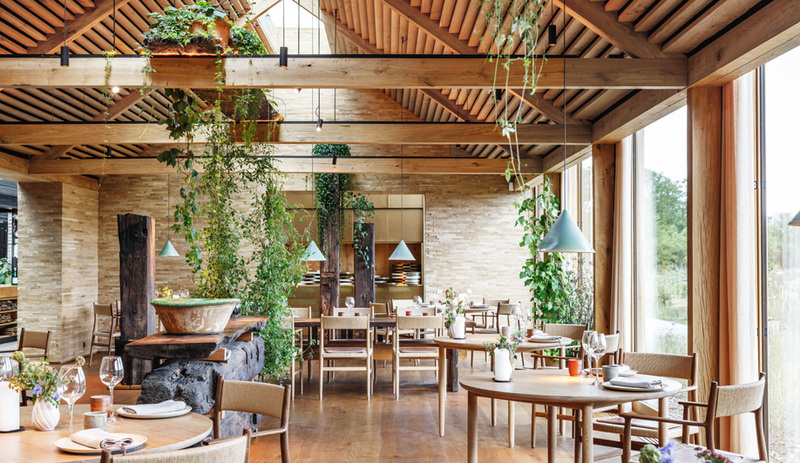 Portuguese architects João Luís Carrilho da Graça and José Paulo Dos Santos were recruited by Promontório to design complementary residential clusters on the 62‑hectare site, and future villas are expected from Peter Märkli of Switzerland and the U.K.’s Sergison Bates. Promontório has two villa clusters under construction, one of which is slated for completion in 2013. In all, seven residential clusters are planned or completed, some with private vineyards, and all reflecting the traditional Mediterranean courtyard home. 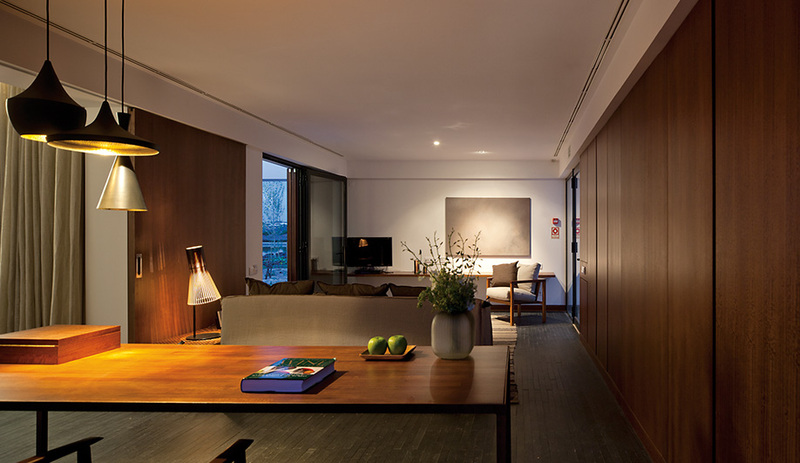 The subtle approach and visual consistency of the buildings, despite multiple architects, is mirrored in the interiors of the hotel and the rental unit townhouses, designed by Brazilian architect Márcio Kogan of Studio MK27. 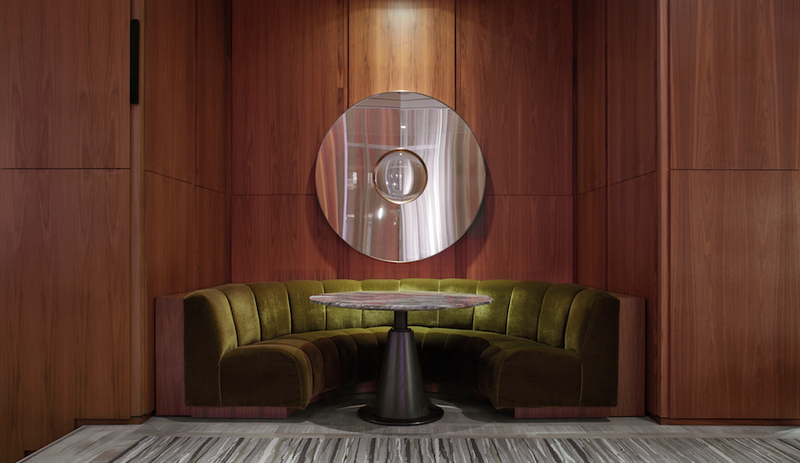 Throughout the hotel, expansive, minimal spaces – combined with natural materials, such as chunky Indonesian wood coffee tables and Portuguese wool rugs – make for a sophisticated earthiness. In front of a horizontal fireplace that spans an entire wall, Vladimir Kagan’s Ondine chairs offer a modernist nod to the wingback. Warming the spare approach is Kogan’s fondness for wood, shown in the slatted screens that shield the townhouses and the main building from views and the intense summer sun. The slat motif reappears in wall panels, and in the bedrooms as Studio MK27–designed headboards. Near the reception area, a large glass opening reveals winemakers at work around the silver vats, turning the winery into a kind of art installation. And just as the architecture is integrated into the landscape, the living experience blends with the winemaking. L’And vintners harvest the owner’s grapes and turn them into bespoke vintages, complete with custom labels. 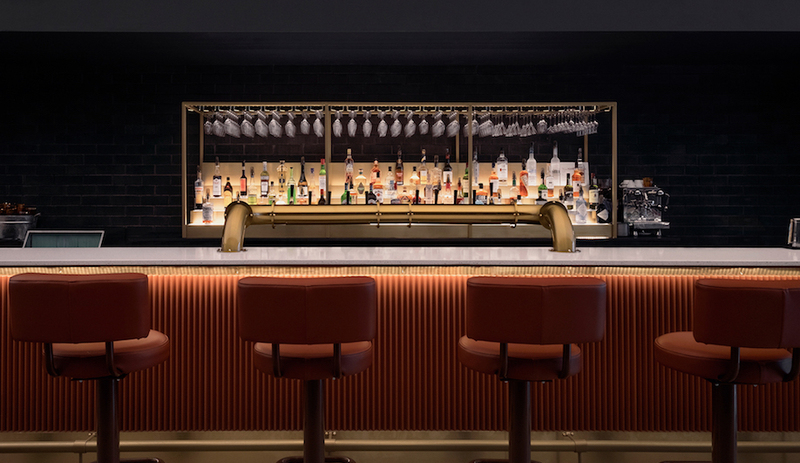 In late 2014, the Sousa Cunhal family group will extend the L’And concept an hour to the southeast, with the 38-suite L’And Reserve Hotel and Spa. Designed entirely by Studio MK27, it will feature modern steel, stone, glass and wood structures that overlook the Alqueva reservoir, carrying on the sensitive blending of old culture with new. 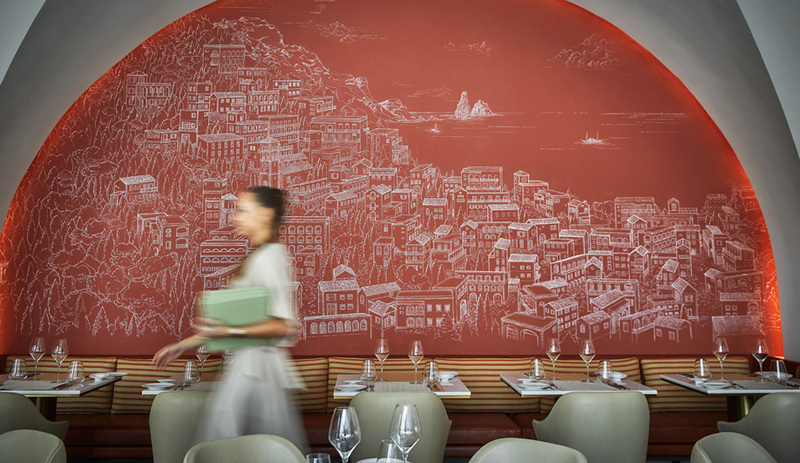 At L’And, chef Miguel Laffan serves up a posh take on local fare (think: cured cod with the resort’s own olive oil or organic pork loin). For a snack, stop by one of the pastelarias in nearby Montemor‑o-Novo before strolling through the castle ruins. For a proper night out, many head to Évora, a 30‑­minute drive away. Fialho ( ­restaurantefialho.com ) and Restaurante Dom Joaquim ( ­restaurantedomjoaquim.pai.pt ) are go-to spots for an authentic Alentejo meal. Life was once turbulent within the ancient fortified walls of Évora. The town was a centre of the Portuguese Inquisition, but now the UNESCO World Heritage Site is packed with monuments and museums spanning two millennia. Start in Praça do Giraldo, a one-time execution ground, then swing by the Roman temple. Other highlights include Palácio Cadaval ( ­palaciocadaval.com ) and Convento dos Remédios. For a drink and a snack – oxtail soup, anyone? – head to perennial favourite Café Alentejo ( ­cafealentejo.com ). In Évora, Adega da Cartuxa ( ­cartuxa.pt ) is one of the region’s largest, most esteemed wineries, and a popular spot for a tour and tasting. Wine presses have operated on the site, a former Jesuit residence, since the 18th century. Countless other small wineries are dotted along the Alentejo Wine Route. Take along a designated driver and find your own way ( v­inhosdoalentejo.pt ), or go with a custom-planned trip from such companies as Cellar Tours ( ­cellartours.com ).